A collection of contemporary crystal glass awards and trophies. These modern crystal awards and plaques are perfect for corporate presentation awards, achievement and recognition awards,as commemorative gifts and for a wide range of sporting awards. All these glass trophies and awards are offered with free engraving of both text and logos, ideal for adding a corporate logo or crest, or logos from an organising body or even sponsor logos. This collection includes flat glass awards and plaques - hugely popular at corporate awards ceremonies and presentations - as well as crystal star awards, crystal globe awards and stunning optical crystal awards. 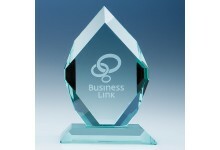 Where indicated, our engraved glass awards and trophies are supplied presentation boxed.